The rhizome of the perennial herb Alpinia of ficinarum Hance. of family Zingiberaceae. Guangdong, Guangxi and Hainan provinces in China. Collected in later summer and early autumn. Red-brownish, thickset, fragrant and pungent in flavor, less branch. Pungent, hot; spleen and stomach meridians entered. Warm middle energizer to alleviate pain, arrest vomiting. 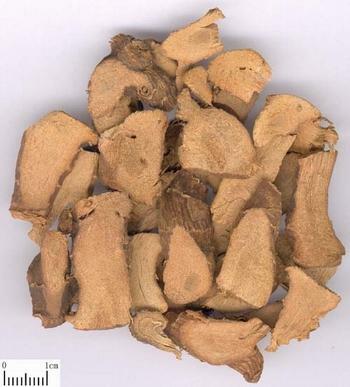 It is the commonly used herb for stomach cold, gastro-abdominal cold pain for its actions of warming middle-energizer and dispersing cold to alleviate pain. It is usually combined with Gan Jiang to reinforce each other's actions. For instance they are combined in Er Jiang Wan described in the book of Tai Ping Hui Min He Ji Ju Fang. For gastro-abdominal distending pain due to stomach cold and liver-qi stagnation, it is usually combined with the liver-soothing herbs. For instance it is combined with Xiang Fu in Liang Fu Wan from Liang Fang Ji Ye (Useful Prescriptions Collection). Its action of alleviating pain also can be used for colic pain on chest or abdomen, distressing fullness in hypochondrium and restlessness, at that time it is usually combined with the blood-activating and meridian-unblocking herbs and qi-moving analgesic. For instance it is combined with Dang Gui, Gui Xin (Rou Gui) and Hou Po in Gao Liang Jiang Tang from Qian Jin Fang. It has the actions of warming middle energizer and harmonizing stomach to arrest vomiting. 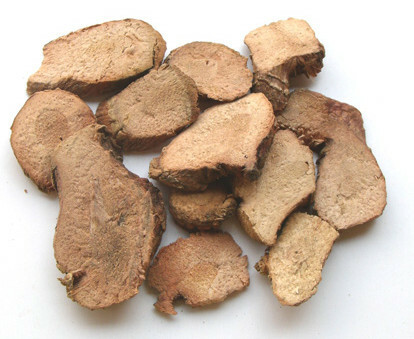 For vomiting due to stomach cold, it is usually combined with Sheng Jiang and Ban Xia. For vomiting due to deficiency-cold, it is combined with the qi-tonifying and spleen-invigorating herbs such as Bai Zhu, Fu Ling and Dang Shen. Decoct 3~6 g, or orally take 3 g powder once.